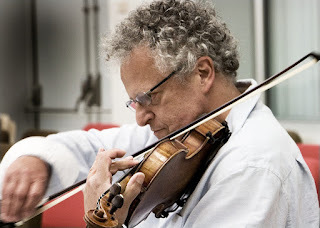 A highlight of Ensemble Linea’s upcoming visit to the Center will be the world premiere of Center artistic director and SUNY Distinguished Professor David Felder’s new violin concerto Jeu de Tarot. 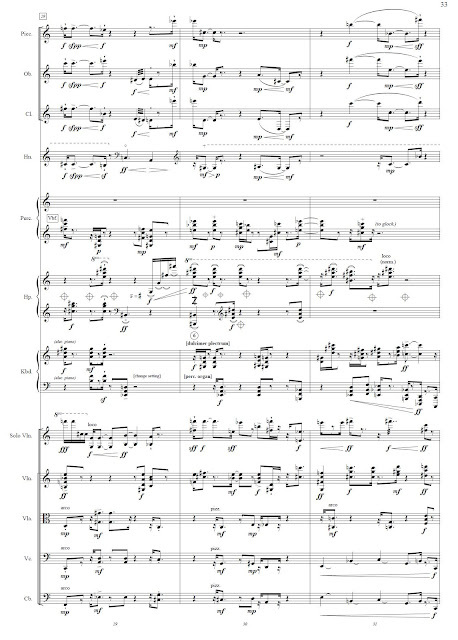 Commissioned by Ensemble Linea, the work is dedicated to the group, its conductor, Jean-Phillippe Wurtz, and guest violin soloist, Irvine Arditti, who will collectively premiere it at a concert in Slee Hall on November 8. The concert also includes works by Brian Ferneyhough and Philippe Leroux. Each card depicts a particular stage and/or problem in the quest for individuation. In Ouspensky’s interpretation, “The Fool” is a sort of snake chasing its own tail: “he knew not where he went, but was absorbed in his chimerical dreams which ran constantly in the same circle.” The Fool carries with him a bag of symbols he has forgotten how to use; the symbols retain their power but he is unable to access it. Felder’s corresponding movement depicts the Fool’s paradoxical trajectory: the music has enormous rhythmic momentum but seemingly no identity or agency. The music seems to be enthralled with a quest to go somewhere, but avoids changing in a significant way: its basic building blocks (elemental figures like attacks, chords, flams, reiterated notes, scales, and arpeggios) never coalesce into characteristic melodic material, or into large-scale goal-oriented processes, but instead captivate listeners with the physicality of their subtly variegated detail. 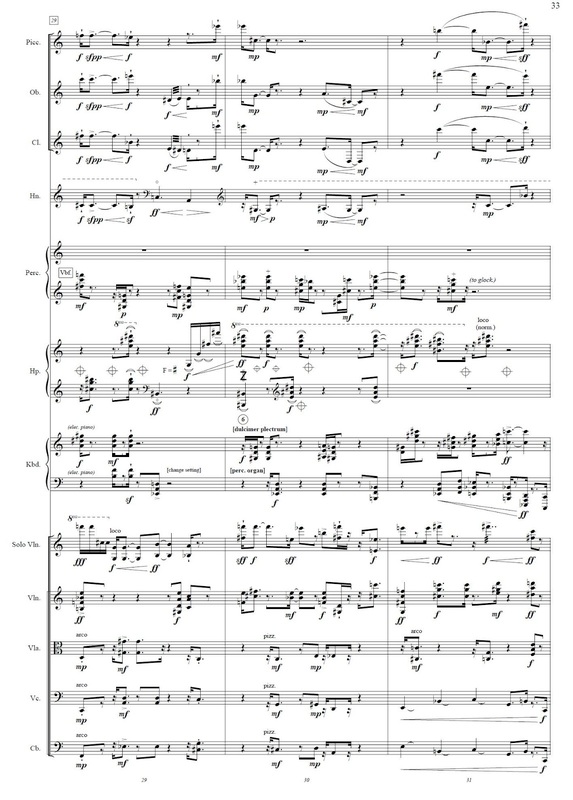 A page from the score of “The Fool” is shown below; a more extended sample of the score is available on Felder’s new website. Jeu de Tarot will ultimately be part of a larger compositional project exploring musical resonances of Tarot. Felder is also grateful to the work’s commissioners, Ensemble Linéa and conductor Jean-Phillippe Wurtz, for their continued interest in his work. “I was particularly pleased with their performance of my 2002 piece partial [dist]res[s]toration, so I am delighted to have the opportunity to create a new work expressly for the group’s superlative virtuosities.” At the Center, we greatly look forward to Linéa’s arrival, and especially to this special premiere performance. In early November, the renowned Ensemble Linea arrives at the Center for 21st Century Music for a residency. The ensemble will perform a concert on November 8 featuring the world premiere of Center artistic director David Felder’s new violin concerto “Jeu de Tarot,” where they will be joined by acclaimed violin soloist Irvine Arditti (of the Arditti Quartet). While in Buffalo, the ensemble will also hold a workshop of new works by Center PhD composers. Founded in 1998 by pianist and conductor Jean-Philippe Wurtz, the Strasbourg-based ensemble has quickly risen to become one of the most highly regarded new music ensembles in the world. Many of the most prestigious new music festivals around the world have hosted performances by Linea: Musica (Strasbourg, France, from 2002 to 2017), ManiFeste (Paris, France, 2016), Darmstadt Ferienkursen (Germany, 2012), Archipel (Geneva, Switzerland, 2008 and 2015), ACMF (Seoul, South Korea, 2009), Budapest Autumn Festival (Hungary, 2009), Aspects des Musiques d’Aujourd’hui (Caen, France, 2009), Ars Musica (Brussels, Belgium, 2011), Ultraschall (Berlin, Germany, January 2013), Huddersfield Contemporary Music Festival (United Kingdom, 2011 and 2013), Contempuls Festival (Prague, Czech Republic, 2013), reMusik Festival (Saint Petersburg, Russia, 2015), MATA Festival (New York, USA, 2016), and the Center’s own June In Buffalo (2011 and 2013). Similarly, the ensemble’s recordings have received awards such as the coveted Diapason d’Or (given out by the critics of Diapason magazine), the Orphée d’Or de la Création Lyrique (given out by the Lyric Recordings Academy), and the Fonogram prize for Best Contemporary Music album at the Hungarian Music Awards (the Hungarian equivalent of the Grammies), and their performances have been broadcast by the national radio stations across Europe, including Deutschland Kulturradio, France Musique, and BBC Radio 3—who aired a live concert by the ensemble. As a result of this recognition, leading composers of today have been inspired to write new works for the ensemble, including Klaus Huber, Ivo Malec, Younghi Pagh-Paan, Michael Jarrell, Péter Eötvös, and Philippe Manoury. Also committed to education, outreach, and access, the ensemble has developed numerous projects to bring performances and instruction to range of settings worldwide. The ensemble regularly collaborates with student composers, in residencies at universities like UB, Harvard, and Northwestern, as well as at festival academies such as Voix Nouvelles (New Voices) at the Abbaye de Royaumont, Darmstädter Ferienkurse (Germany), the composition academy of Philippe Manoury at Festival Musica, as well as June in Buffalo. In 2014, the ensemble set up its own academy focused on the performance of contemporary music, for both instrumentalists and conductors. The annual academy has expanded each year, with increasingly international groups of students. The ensemble’s educational activities also reach beyond student musicians, bringing contemporary chamber music to places where it is not readily accessible. The ensemble regularly presents free concerts, workshops, and public rehearsals in public libraries, music schools, municipalities, and cultural centers, often in collaboration with the cultural center of Vendenheim, the multimedia libraries of Strasbourg and Cernay, and the cultural department of the city of Saint-Louis. The ensemble often develops innovative programming for these occasions, such as “Stockhausen for Kids,” a staged multimedia event developed in collaboration with puppet theater company Flash Marionnettes, which has been presented across France, drawing a crowd of 4000 at the Musica Festival. Concurrently, the ensemble aims to be a musical ambassador, an “active participant and facilitator in the geopolitical landscape” through worldwide touring. Towards this end, the ensemble has sought to tour in regions where institutional infrastructures for contemporary art music are less developed: the Middle East, Russia, and Korea. 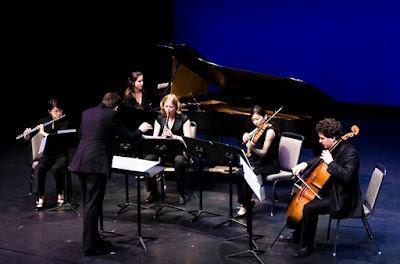 The ensemble has also toured the US three times prior to this year’s visit (2011, 2013 and 2016), sponsored by FACE (French American Fund for Contemporary Music) and anchored by visits to the Center for 21st Century Music. Linéa’s concerts in the US have attracted wide notice, including coverage in the New York Times. At June in Buffalo, their exciting yet polished performances of challenging pieces by faculty and student composers made strong impressions on audiences. We greatly look forward to their return!